Disclaimer: Jeff Walker or his associates didn’t pay me to write this review. This review is solely to share my experience of this course. I will not receive a commission if you buy this course. I became interested in his work because Jeff and I play on the same team. We are both authors at Morgan James Publishing. His flagship product is Product Launch Formula, a near $2,000 internet marketing course. That course was a detailed blueprint to show how you can launch your product by using internal launches, JV launches, and/or seed launches. For many people, Product Launch Formula looks like an expensive, online course. However, it doesn’t look so expensive when you compare it to a bachelor’s degree in digital marketing from an accredited university. Most peple care about the return on investment. If I invest in a few thousand dollars on this course or degree, how much will it enable me to earn over the next few years? 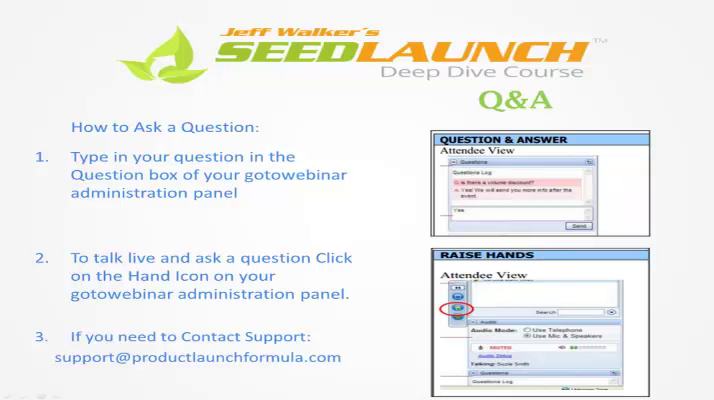 In 2014, Jeff released another online product, Seed Launch Deep Dive. The course focuses specifically on seed launches - how to make money from launchng a product that you didn’t create yet. This course costs $1,000 less than Product Launch Formula and it’s the better option for people who want to start making money as soon as possible. This course has five video modules (audio-only versions included), 10+ hours of Q&A sessions, two case studies, and email swipe files to use in your product launch. Whether you have an email list of a thousand, hundred, or even zero, this course shows you how to launch an online product, even when you don’t have an email list. Basically, you are pitching a proposal for a course offering and selling it before you create it. You don’t have to waste time anymore on creating a course that people won’t buy anyway. While Jeff explained several sections of his prelaunch and sales scripts, I wished that he would have explained every section of both scripts. Although, for the price ($997) and the value (noted above), I would recommend the Seed Launch Deep Dive course to others.